This volume brings together new and classic articles by one of the leading scholars in comparative politics. The articles focus in particular on the nature of contemporary democracy and its prospects. 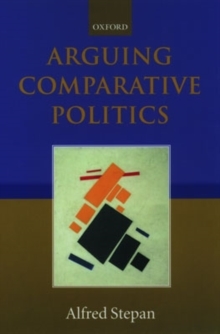 The volume begins with a personal analysis of the intellectual, and often political, reasons why and how Stepan chose to engage in certain critical arguments over the last thirty years. The volume is then divided into three sections, each with a distinctive theme: stateand society; constructing polities; and varieties of democracies. The introduction and articles ask whether, both for intellectual and political reasons, there are strong grounds for questioning both Rawls and Huntington on religion and democracy, Riker on federalism, and Gellner on multinationalism. The volume contains articles on civil society, political society, economic society, the military, and a usable state. The possibility of multiple and complementary political identities is argued for. The incentive systems and political practices of the threemacro-constitutional frameworks for democratic government- parliamentarianism, presidentialism, and semi-presidentialism- are compared and contrasted.